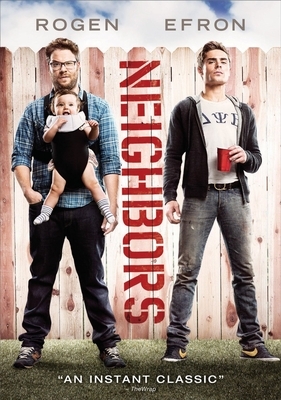 By all appearances, new parents Mac (Seth Rogen) and Kelly Radner (Rose Byrne) are living the American Dream - complete with an adorable baby girl and a beautiful new starter home in the suburbs. Still, the early-thirtysomethings want to believe that they have a modicum of coolness left within them. So when they discover that their new next-door neighbors are none other than dozens of Delta Psi Beta fraternity brothers led by charismatic president Teddy Sanders (Zac Efron), they try to play along and make the best of an awkward situation. But when the frat's parties grow increasingly more epic, both sides of the property line begin to fend for their turf. The neighbors' relentless sabotage escalates into outrageous one-upmanship, beginning an epic Greek war for the ages. Also stars Dave Franco and Christopher Mintz-Plasse.